Oscar De La Hoya voluntarily misses “The One” – a bizarre publicity stunt or a necessary urgent measure? Oscar De La Hoya has stolen the lime light from Floyd Mayweather and Saul Alvarez for a moment by going public with his personal demons and choosing a climatic stage of the hype to “drop his bomb”. What kind of an emergency could not wait for several days and prevented him from attending an event of such magnitude? Has he become so dysfunctional that he has to be removed from the scene as a liability to the joint venture? Was there an “intervention”? He is the owner and founder of Golden Boy Promotions and even if he has only representative status at the company, he is hardly expendable. Even if his attendance at the Sept. 14 card is not of vital importance, his absence will be very conspicuous. The internal conflict transpires even in the press release where a public announcement calls for privacy in a vocally publicized personal dilemma. There is something symbolic and ceremonial in such a confession, it’s almost like self-whipping. Such a move deserves approval but modern medicine perhaps could have helped the president of a filthy rich company “play with a full deck” for a couple of days. Something is missing. Now we have to wonder about his state of mind when he favored Saul Alvarez to win (so did this humble author and he is not checking in anywhere before Sept. 14). Was the “blueprint“ he gave to Alvarez free of any distortion caused by “augmented perceptions”? Why does he have to lose all credibility just before a climatic showdown? If Mayweather vs. Alvarez wasn’t enough for some people, the co-feature of Mathysse vs. Garcia should have covered any loose ends. Oscar’s decision to dodge responsibility and seek refuge into a rehabilitation facility is very unsettling to fans. Boxing has been plagued by substance abuse ever since boxers started making enough money to afford stimulants. Addictions have been the reason for many undone careers and squandered fortunes. It wasn’t long ago when Mike Tyson had a similar public moment of self-imposed “intervention” when he chose to speak about his secret abuse. Such abuse can not remain a secret for very long anyway. Perhaps De La Hoya’s choice was the right thing for him, although the timing is bizarre to say the least. Hypocrisy aside, this is a personal issue and it should not interfere with social life. There has been a lot of sentiment among fans for the misfortunes of boxing stars, for example a household name ending up penniless on the street. Such sentiments subside quickly, I don’t know of fans that have done anything to help like sending money or offering shelter and I can’t blame them. Let me put it this way: boxers did not share their proceeds with the fan in their sunny day, so their rainy day is their own problem. Fans should not pry into the personal lives of the stars. Fans should judge boxers by the way they box, not by their “shiny” personalities or by the roles they assume. I couldn’t care less about Floyd’s legal troubles or about Alvarez’s English language proficiency or origin of financial support. All I expect from them is to fight their best. One boxer who has spent his earnings on the fans is Roberto Duran. He reportedly spent everything he earned on the people in the slums of El Chorrillo in Panama City. Even this is a spurious choice as you can be of no help to anyone after you spend all money fast. Duran has not asked for sympathy though. He was a fighter’s fighter cut out from a different cloth and none of the participants in this Saturday’s card could ”carry his jockstrap” or that of the other members of “The Fabulous Four”. Neither could Oscar for that matter. 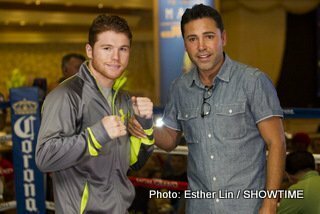 Next boxing news: Does Canelo Have the “Style” to Beat Mayweather? You are here: Home / Boxing News / Oscar De La Hoya voluntarily misses “The One” – a bizarre publicity stunt or a necessary urgent measure?